How do you guys like the controller? Would you prefer it to mouse/keyboard? To be honest I like traditional gamepads (or mouse+keyboard) better than a touch-based gamepad, but, you know, you can’t really judge based on a prerelease controller, etc, etc. This version doesn’t even have the touchscreen yet. (I am not really sure what we would use the screen for in The Witness, but it is just an example). The Steam controller actually does a really good job of emulating a trackball with a touch surface + slight rumble and emulated momentum… which is pretty freaky. It feels more physical than it has any right to. But there are probably very few games that you actually want to play with a trackball, so I would expect most game configs to turn that off. In general I kind of want physical face buttons and not a touchpad, because with a touchpad you have the same problem you have with virtual joysticks on iOS. There’s a reason Apple is looking into trying to get people to buy controllers: virtual joysticks are not very good. The Steam controller is a bit better than that (in part because you can feel exactly where the touch surface is, so you won’t get lost like you do on a big iPad or something), but I feel like it sort of has the same issues in terms of not knowing when I have really pressed something. In contrast, for example, the PS4 controller has buttons that are very easy to press and it is very clear when you have pressed them and when you have not. So if you have a game that involves firing off definite actions frequently (which most games are!) I would rather have a PS4 controller at this time. But, like I said, this is not the final Steam controller, so it is not a fair contest. They actually removed the touchscreen from the device, they said so at steam dev days ..
There’s a confidence that comes with hitting a physical button. You can feel it click down, feel where it is in relation to other buttons, and know exactly how it will react. Like you said, it’s not released yet so I’ll hold my judgement, but from every demo of it I’ve seen so far it looks clumsy and less than ideal. I think the point of the steam controller is that it tries to be a better all-rounder controller. Mouse keyboard is already great on the majority of games, but doesn’t work well if you want to play on a couch or with other people on the same screen. Perhaps more importantly, VR would be terrible with KB+M. Xbox gamepad is a really nice controller, but analogue thumb-stick will never give as high resolution pointer control as a mouse can. If, after some fine tuning, they can passably virtualise thumb-sticks and buttons with the touchpads, then this will have achieved its purpose. Ooooh, it’s like you might launch on Linux or something. 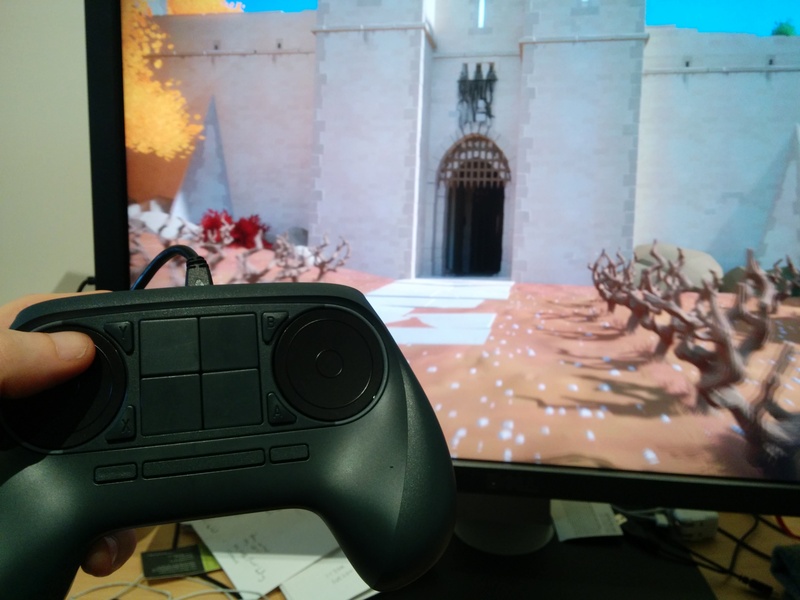 My Steam Controller stopped working in the Witness, without my changing any settings, about a week ago. The controller passes its diagnostic tests on the Steam site, so the hardware seems to be okay. Does anybody have any idea why it would suddenly stop working?